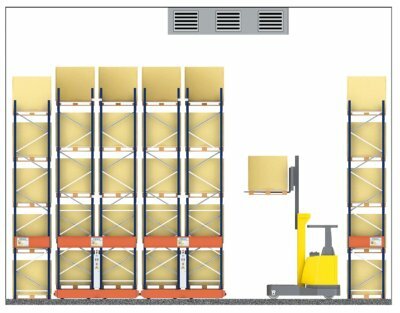 Eight feet of added ceiling height may not seem like a lot, but for warehouse builders, the extra clearance can be the difference between an empty building and one that attracts a tenant such as Walmart.com or Amazon.com. 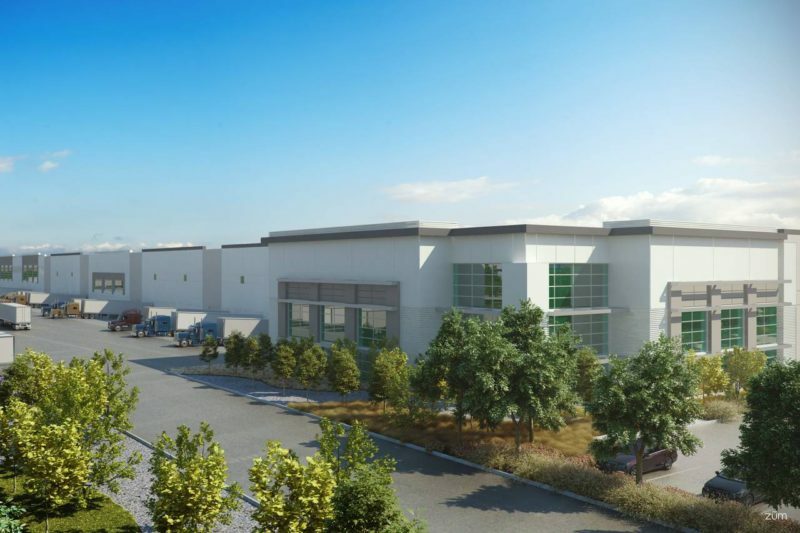 Real-estate firm Prologis Inc.’s latest project, a one-million-square-foot warehouse in Tracy, Calif., will boast a 40-foot-high ceiling, 25% taller than the typical 32 feet. The project isn’t pre-leased, making this the first speculative building of such dimension that the company has built. 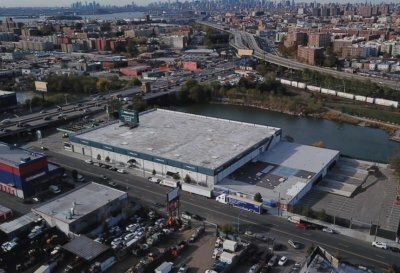 Prologis executives said it is going bigger to tap into the e-commerce boom, which is changing the way industrial properties such as warehouses and fulfillment centers are built. E-commerce retailers need more space than do wholesalers that ship goods in bulk to stores, because they transport a vastly wider variety of products in much smaller batches. “If your stapler breaks, you go online and you order a single stapler. 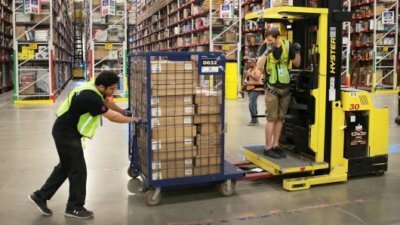 If you’re delivering to OfficeMax, you don’t go into a warehouse and pull one stapler off the rack, you pull out a whole pallet of them,” says Scott Lamsen, president of Prologis’ northwest region. As a result, e-commerce companies need workers to pick out and pack each product by hand. They often build multiple mezzanine levels and racking systems known as “pick modules,” which are typically about nine feet high. Ceiling heights of 40 feet, rather than the industry-standard 32 feet, allow a distributor to build three levels above the ground floor instead of two, and still leave room for light fixtures and fans. The share of retail sales conducted online has been growing steadily since at least 2005, clocking in at 6.7% in the fourth quarter, according to the Census Bureau. The increasing sales online stimulate the need for more spaces to stock, sort and pack shipments to send to shoppers. 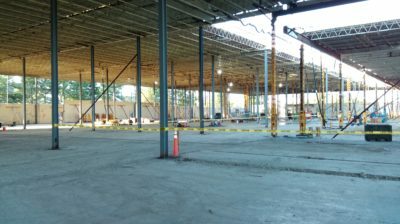 Most warehouse construction in recent years has been of structures with ceiling clearances of 28 to 36 feet. Since 2011, of the 554 large warehouses built in the U.S., 89% have had ceilings between 28 and 36 feet high, according to brokerage CBRE Inc. Only 52, or 9.4%, have had heights of 36 feet to 40 feet, and only 11 have had heights above 40 feet. Consultants and executives at logistics firms say larger warehouses with taller ceilings are becoming more prevalent. Warehouses began to get taller in the U.S. even before the recent, explosive growth of e-commerce, as new automation technologies such as racking robots and new forklifts came into use, allowing logistics companies to access items stored at loftier heights. That saves money by allowing retailers to build vertically, rather than horizontally, which requires more land. Overall size is rising as online retailing grows, forcing retailers to keep a wider variety of products on hand. Prologis says large e-commerce users can keep as many as 1 million distinct items known as stock keeping units, or SKUs, on hand at their distribution centers. A typical e-retailer uses three times as much warehousing space to generate $1 billion in revenue as a traditional brick-and-mortar retailer does, Prologis says. The Tracy Calif., warehouse is part of a larger 1,800-acre project known as the International Park of Commerce, which is under construction and set to be completed in August. Prologis says several large distributors already have expressed interest in the park’s first building. FedEx Corp. and medical products manufacturer Medline Industries Inc. said in late April that they had signed up to be the park’s first tenants, and construction has begun on two other buildings to serve them. Stifel real-estate analyst John Guinee said Prologis is betting the Tracy project will benefit from growth at the Port of Oakland, about 50 miles to the west, including from retailers that sell goods manufactured in Asia via their online stores.